With robust accounts receivable and accounts payable, boost rent collection efficiency, security and convenience and easily track property expenses with Propertyware Accounting. Propertyware allows for you to set up recurring charges for garage or storage rentals, extra parking, and so much more. This allows for consistency and accuracy throughout the tenants’ lease term. With Propertyware, you can easily and quickly pay multiple owners or vendors at one time, preparing and process owner draws with just a few clicks. With Propertyware’s ‘Match’ software solution, you can easily begin a new bank reconciliation, upload your bank statements and begin the process to match transactions seamlessly. 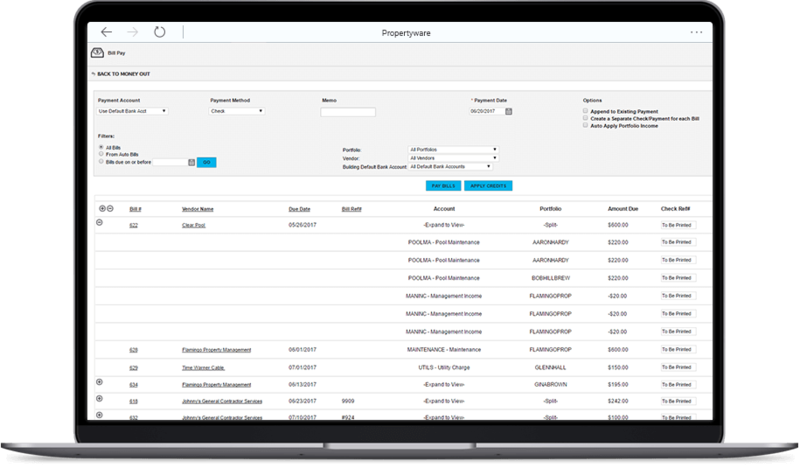 Propertyware’s integrated software solutions allow for easy, custom reports you create to show you budgets for each property. This allows for consistency and accuracy for you and your owners. Propertyware even allows these reports to be scheduled for distribution to your owners for clear visibility into their assets.